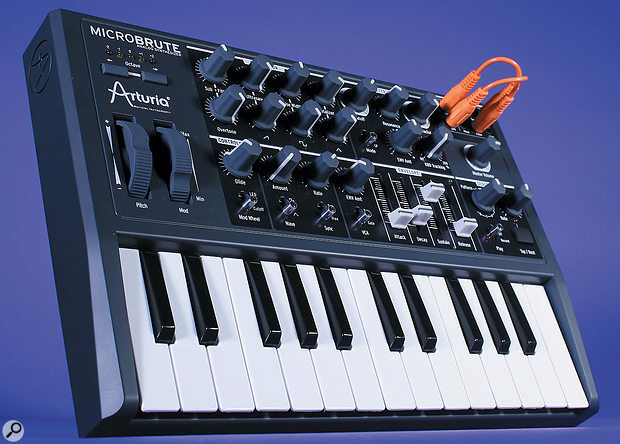 Arturia's new Brute is even smaller than the last and, quite frankly, very cheap indeed. What's not to like? When Arturia released the MiniBrute, they took a gamble and ramped up production to meet an unproven expectation of sales. But, as history demonstrates, their sales predictions may have been conservative because getting hold of one was quite tricky for the first few months. Initially, this may have been because it was no more expensive than a second-hand SH101 or MS10, but I think that it soon became a consequence of the MiniBrute's sound, which could be as warm, edgy, and extreme, as one wished. As a result, I was keen to hear what the MicroBrute could offer, especially since it appeared (at first sight, at least) that the two were to be rather similar. While the MicroBrute is the progeny of the MiniBrute, I soon discovered that the differences between the two were greater than I initially thought. Let's start with a physical comparison. In my review of the MiniBrute in the March 2012 issue of Sound On Sound, I described the MiniBrute as tiny. I was wrong. The MiniBrute is very small; the MicroBrute is tiny. In part, this has been achieved by reducing the space between the knobs and switches (although not the sliders) and, in part, by removing nearly half of them (there are now 30,as opposed to 51 before). Nonetheless, there's still a lot crammed onto its control panel, and Arturia should be complimented on achieving this without everything feeling unduly fiddly. 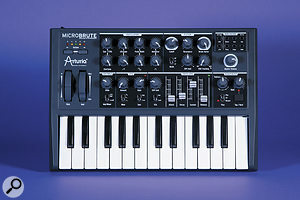 A more significant difference is found in front of the controls, where a spongy miniature keyboard that appears to generate neither aftertouch nor velocity has replaced the narrow but playable, aftertouch-sensitive MiniBrute keyboard. For many users, this may be irrelevant; if you plan to sequence the MicroBrute or use it as an effects generator, the mini-keys won't hinder you. But if you're a paid-up member of the widdly-widdly society, you're going to have to play it from an external MIDI keyboard. Internally, the MicroBrute shares the MiniBrute's VCO to VCF to VCA signal path, although with fewer contour generators and modulators. Happily, it retains the MiniBrute's underlying oscillator structure, although closer inspection reveals that there are numerous differences. For example, the pulse and triangle waves have lost the Env Amt controls for the PWM and Metalizer effects, and the sawtooth wave has lost the rate control for the Ultrasaw (ensemble) effect. Sure, you can recreate these routings using the miniature patch bay (which Arturia calls its Mod Matrix), but not in full, and not at the same time. Something that has been lost in its entirety is the noise generator, which is a shame, but not a fatal flaw on something of this size and cost. In contrast, the sub-oscillator has lost the MiniBrute's simple saw/square and -1/-2 octave options and has been enhanced with a modulation circuit that sounds similar to sync. Arturia now calls this source 'Overtone', and the modulation — which can be controlled manually or via the patchbay — is annotated as 'Sub>Fifth'. As you sweep this, the oscillator generates varying degrees of the third harmonic of the sub-oscillator pitch, which is an excellent arrangement because it allows you to create 'root and fifth' tones and even what would be described on a Hammond organ as XXX00000 tones, for a depth and power that belies the synth's single-oscillator architecture. Next in the signal path lies the Steiner Parker filter first seen in the MiniBrute. Except that it isn't the same as the MiniBrute's. For one thing, there are three filter modes rather than four — the notch mode has been discarded — and the fast/slow contour option has also disappeared. More significantly, the characters of the two filters appear to be slightly different. Much of this appears to be a consequence of the oscillator output level (or the filter input gain) so, if you adjust the oscillator levels appropriately, the two become more similar. But you'll still find that controls such as the bipolar ENV Amt act rather differently, with the MicroBrute's envelope capable of opening the filter further than the MiniBrute's. This may just be a difference in the calibration of the VCA controlling the contour CV level, but it means that there are sounds that you can obtain from the MicroBrute that you can't from the MiniBrute, and no doubt vice-versa. Ultimately, the differences in the filter circuit and response are greater than I would expect to obtain from identical circuits (which they are not — no notch mode, remember), even allowing for component tolerances, but it's still fair to say that the underlying character of the MiniBrute'sfilter has survived. The MicroBrute really is micro, measuring just 325 x 221 x 60 mm. In addition to the expected cutoff frequency, resonance and Env Amt controls, the filter again responds to the keyboard CV, with tracking ranging from zero percent to (a claimed) 200 percent. On the review unit, 100 percent was at about the two o'clock position and, in isolation, I couldn't get this to track correctly over more than a few notes. Happily, it locked to the signal from the oscillator and then tracked perfectly, which meant that I could create sounds containing as many as four pitched elements; the three generated by the oscillator, and another from the self-oscillating filter. After the filter and the audio VCA, you'll again find the feedback loop that Arturia calls the Brute Factor. Inspired by the trick of feeding the Minimoog's second output back into it's external signal input, this creates a range of effects from mild thickening, through overdrive, to distortion. It's not as wild as you might expect, and the promised "highly unpredictable results at extreme settings” don't often materialise, but I think that that adds to the musicality of the effect. You may disagree. 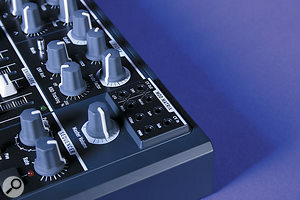 One area in which the MicroBrute differs significantly from its predecessor is in the provision of contour generators and modulators. There is just a single ADSR envelope generator on the new model so, in common with some vintage synths, the MicroBrute offers the option of controlling the audio VCA gain using either the contour or the gate pulse. It might not look like much, but the MicroBrute's Mod Matrix adds an amount of flexibility unusual in a synth this size. As already mentioned, there's no fast/slow contour option in the VCF, so the MicroBrute's rates are a compromise between the two MiniBrute rates, with maximum A, D and R stages of around 2.5s. To be honest, these are too short for my tastes; you're not going to achieve languorous sweeps or gently decaying sounds using the MicroBrute. More differences lie in the LFO, not least because (overlooking the dedicated LFOs within their Ultrasaw generators) the MicroBrute has one of them, whereas the MiniBrute has two. Interestingly, the maximum rate obtained from the MicroBrute's LFO is higher than that obtained from the MiniBrute's primary LFO, and its amplitude is higher too, which means that the MicroBrute's modulation can be more dramatic. On the other hand, the primary LFO in the bigger model generates six waveforms, whereas the smaller model has lost the sine wave, S&H and smoothed S&H waves to leave just the standard triangle, square and sawtooth options. Also, there are four pre-patched destinations on the MiniBrute (the Metalizer effect, pitch, filter cutoff frequency and audio amplifier gain), whereas there is just one on the MicroBrute (the oscillator pitch). This goes a long way to explaining why the patchbay is so beneficial. Offering 3.5mm CV outputs from the LFO and Envelope as well as inputs for the pitch, filter cutoff frequency and pulse width, as well as the Metalizer, Ultrasaw and Overtone effects, it goes a long way to overcoming the lack of internal connections, and adds all manner of additional possibilities when hooked up to a modular (or semi-modular) synth. You can even take the pitch CV output on the rear panel and use it as a source in the patchbay. Everything conforms to the 1V/oct standard, which means that — despite needing a handy selection of 3.5mm to quarter-inch adapter cables — you're going to be able to use it with the majority of modular systems and sequencers, which is unusual for something so small and affordable. However, be aware that inserting a cable into one of the CV Out sockets breaks its internal connection so, unless you use an external Multiple (the manual suggests that a single CV output "should be able to drive up to four inputs”) you are replacing the pre-patched connections, not adding new ones. Strangely, despite all this flexibility,there's no input for the VCA Gain so, like the absent S&H effects, tremolo is off the menu. Unlike the MiniBrute, which incorporates an arpeggiator, the MicroBrute offers a step sequencer that can hold up to eight, 64-step, user-programmable sequences at any given time. Programming a sequence couldn't be easier; just select the desired pattern number, set the appropriate switch to 'Record', play the notes (adding rests using the button where appropriate) and, when finished, return the switch to 'Off'. This operation erases the existing pattern and saves what you have just played. You can then replay this using the internal clock or, if MIDI Clock is detected at either input, synchronise it to an external source at a clock/divide value determined by the Rate knob. This also means that you can sync your modulation to the outside world, because the LFO can be slaved to the sequencer. That's a nice bonus. When delivered, the review unit didn't track correctly across a wide range of notes, no matter how long I allowed for it to warm up. Fortunately, a few minutes with a small screwdriver and my trusty tuner did the trick and, when scaled and tuned using the micro screws on its rear panel, it tracked well across the full range of a 76-note MIDI keyboard. Mind you, it always took a long time to reach its operating temperature and slide into tune, so don't expect to be able to play one for at least 15 minutes after taking it out of the back of your car on a winter's evening. In addition to the facilities mentioned above, the MicroBrute offers portamento, fine-tuning of plus-or-minus two semitones and transposition of plus-or-minus two octaves (for a total range of six octaves). However, there's no provision for semitone transposition, so if you need to play a solo in F#, you're going to have to learn it that way, not cheat by transposing it into C.
But despite its seeming simplicity, it still has a few quirks up its sleeve. For example, I made a bit of a prat of myself by contacting Arturia to ask whether the review unit was faulty when, having patched the ENV output in the patchbay to the oscillator input to create a simple pitch sweep, I couldn't obtain an effect. "Did you turn up the ENV Out knob next to the VCA Env/Gate switch?” they asked me. Of course, I hadn't. Given the position of the knob (which appears to be 'in the VCA section') it didn't occur to me that I should do so. So be warned that not everything is as intuitive as it might seem. Arturia claim that the MicroBrute offers "the largest oscillator sound around” and, while I shy away from hyperbole, this may be correct. You might argue that an original Moog 901 has more depth, but I know of no other analogue oscillator that can generate the equivalent of the 16', 8' and 52/3' pitches simultaneously, all with multiple flavours of waveshaping. Nonetheless, the MicroBrute doesn't always lend itself to the classic sounds of, say, a vintage ARP or Moog, and it doesn't enjoy being pushed in directions that it doesn't want to go. It's much happier generating its own flavour of lead sounds and noodling around in its own experimental space, although, in both of these cases, its inability to do simple things such as (say) create PWM sounds with vibrato is a frustration. Of course, you could overcome this by hooking it up to some external devices, but that's not the point: the MicroBrute has limitations and, at this price, it's understandable that it should. While experimenting with patches that used the various waves and waveshapers, I was disappointed to find that I couldn't get the same range of timbres from the MicroBrute's Metalizer effect as I had been able to obtain from the MiniBrute's; the sound was somewhat darker and less engaging than before. But if you're after bass sounds that will have your neighbours calling the local council's environmental officer, don't worry... with a little thought, these can pour forth. Sure, its 12dB/oct filter means that it's never going to imitate the deepest of Moog basses but, if you're happy with a different type of sound — say, combining the Overtone generator with one or more of the other oscillator outputs with some Brute Factor dialed in — you'll discover a different family of speaker rattlers awaits you. Next, I hooked the review unit up to the MiniBrute with which I'd been comparing it, and it was here that things really took off. If you're thinking of buying a dual-oscillator vintage monosynth, I recommend that you try the combination of a MiniBrute and a MicroBrute, which may cost you no more. Quite apart from the sounds that you can generate with their independent oscillators, waveshapers, filters, and all the other gubbins, the marriage of the Mini's arpeggiator and the Micro's sequencer is a thing of synchronised joy for anyone interested in electronic music. To finish, I connected the MicroBrute into a modular system comprising my Analogue Systems RS8000, an RS200 step sequencer, and a French Connection controller. I didn't have much time to experiment with this setup, but the initial results were very encouraging. Imagine playing the Metalized wave through an EMS Synthi filter, or mixing the outputs from four Moog-style oscillators and playing them through the Steiner-Parker filter. Clearly, this is an avenue that warrants much more investigation. If you view the MicroBrute as an agglomeration of a semi-patchable VCO, VCF, VCA, ADSR and LFO, it looks to be good value. When you add the keyboard and the performance controls, take into account the unusual flexibility of the oscillator and the heritage of the filter, and then realise that you don't need a Eurorack to house everything, it starts to look like excellent value. So it seems almost churlish to want more, although there are things that would improve it. Forget adding memories — that would turn it into a different product. A more practical wish would be to see the velocity generated by the keyboard (see the 'Connecting With The Brute' box) routed to the filter cutoff frequency and the VCA gain. Likewise, reinstating the MiniBrute's aftertouch would be welcome. And, while we're on the subject of keybeds, why don't Arturia give either or both of the 'Brutes the 61-note units from the Analogue Experience and KeyLab series? That would turn them into 'real' performance synthesizers. Finally, I can see some potential owners decrying the lack of battery power. Arturia have addressed this on their web site, explaining that the size and weight of batteries needed to power the MicroBrute's rather 'hot' rails and retain its sound quality would be excessive, and out of keeping with the synth's image. You may or may not choose to accept that. For around £250$300, the MicroBrute is a pure (well, almost pure) analogue synth, and it sounds like one. It offers a remarkable set of facilities for something so small, and while its character may not appeal to everyone, it's always great fun. Given its price, its only serious pitfall is the row of unresponsive black and white lumps found along its front edge. If this matters to you, just treat it as an expander and play it using a full-sized keyboard. Despite being the 'son of MiniBrute', I think that the MicroBrute will become a significant success in its own right. 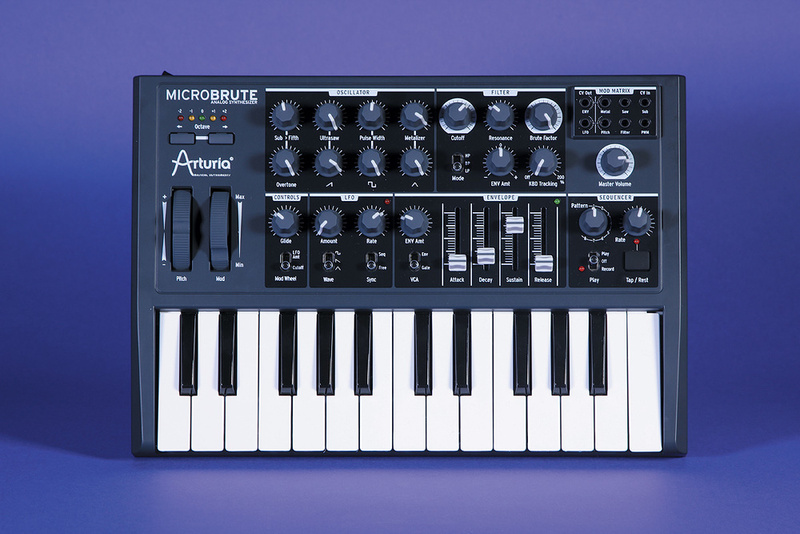 Indeed, I've noticed that Arturia aficionados have started to refer to the MiniBrute as 'the Mini', and to the MicroBrute as 'the Micro'. A small point, perhaps, but it reveals a significant change in the psyche of the synthesizer-buying public. For more than 40 years, 'the Mini' referred unambiguously to a single synthesizer, and it wasn't French. The fact that this may no longer be true suggests that Arturia are on the way to achieving something quite extraordinary. There's one other recently released synthesizer that combines a degree of patchability with a miniature keyboard: the Korg MS20 Mini. Of course, the Korg isn't as affordable, but it offers two oscillators, greater flexibility in many areas, and a sound that makes some grown men swoon. In contrast, the MicroBrute has one oscillator and a sound that, in the grand scheme of things, is as yet unproven. Nevertheless, given the price and size of the MicroBrute, as well as its unusual architecture, I could see some players finding it hard to choose between them. The MicroBrute offers an unusual amount of connectivity. On the rear panel, you'll find a quarter-inch jack for the main audio output, together with a 3.5mm stereo jack (which carries the same signal on both channels) for headphones. There's also the quarter-inch audio input and its associated level control that allows you to mangle external sounds using the MicroBrute's filter, audio amplifier and feedback loop. Alongside these, you'll find a conventional five-pin MIDI input and a bi-directional MIDI/USB port that allows you to use the MicroBrute as a tiny remote keyboard. Remarkably, it's both polyphonic and velocity-sensitive when used in this fashion, and also sends pitch-bend, mod wheel, and octave information. The PSU input is for an external 12V DC power supply of the 'snake that swallowed a wombat' variety. I'm usually critical of these, but I accept that it would be hard to find space for a universal supply inside something as small as the MicroBrute. To the left of this panel, you'll find a +5V Gate In, a +5V Gate Out and a 1V/oct CV Out. At first sight, it seems that there is a huge omission here — the lack of a pitch CV In so that you can sequence the MicroBrute from other analogue synths and sequencers — but this has simply migrated from the rear panel to the patchbay. Like the MiniBrute, the MicroBrute comes with a set of laminated patch sheets to get you started. There are 10 of these (plus five blanks onto which you can record your own sounds) and, although I'm not a huge fan of the sounds they describe, they are a good way to get beginners started. If you want more blanks, you can order them from Arturia's web site. Although the MicroBrute is in most respects an analogue synthesizer, it boasts a number of parameters that you can control from your computer using its dedicated MicroBrute Connection software. This allows you to customise the synth engine in several important ways, such as selecting the note priority, the contour and LFO triggering modes, the pitch-bend range and, for use as a MIDI controller, the velocity response curve. The largest section of the editor is given to the sequencer settings, which allow you to determine the clock source (internal or external), the playing mode, how patterns are retriggered and changed (including the all-important 'wait until the current pattern has been completed' mode), and the timing relationship between clock pulses and notes. You can also adjust the gate length of sequenced notes (25, 50 or 75 percent) although this can lead to unexpected (well, to be honest, erroneous) results when combined with the fastest of the clock divisions. You can also use the editor to determine the channels on which the MicroBrute will receive and transmit MIDI data (which don't need to be the same), and all of the parameters mentioned here can be controlled using MIDI CCs (or, in the case of the pitch-bend range, an RPN). A further page allows you to save, edit and re-load sequences. On saving, you can generate two types of file simultaneously; .MBSEQ files contain the full set of sequences within the MicroBrute, and individual .MID files that you can use in other sequencers and workstations. That's neat! Even neater is the fact that the .MBSEQ files are simply text files that you can modify using a text editor. You can therefore modify sequences or even type in new ones before loading them into the synth itself. The final page allows you to update the synth's firmware. It's incredibly small for an analogue synth with so many features. The patchbay is a significant bonus, allowing you to use it with modular and semi-modular systems. It can sound great, and it's fun. The keyboard will be all but useless for some players. The maximum Attack, Decay and Release times are too short. Despite its flexibility, some bread-and-butter sounds are unobtainable. Not everyone will warm to its unusual character. Yet again, Arturia have found an empty niche into which to insert one of their synthesizers. You would have thought that the company might sit back and just enjoy the plaudits heaped upon the MiniBrute, but they have instead come up with another winner that will sell to hardened synthesists who can't resist the allure of a new toy, as well as to teenagers choosing their first 'real' analogue synth. Damn, the French are getting good at this synthesizer lark!